The data utilized by the Provider Directory Lookup is updated on a daily basis. Go to the Provider Directory Lookup. You will first be asked to choose one of the Sagamore products prior to performing your search. You will need to choose from either Sagamore Plus, Sagamore Select or Sagamore Ambassador Care. Check your ID card if you are not sure in which product you are enrolled. The Specialty drop down list has been reorganized based upon your product selection to make it easier to use. The "default" specialty selection will be for ALL providers within the chosen Sagamore product. Each individual specialty that applies to the chosen product will then be shown. The Network Hospitals selection appears only if you chose the Sagamore Plus or Select products. 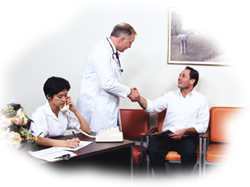 For Ambassador Care, the specialty list is limited to Primary Care Physicians only. If you select the default "All Primary Care Physicians" then all physicians in specialties considered Primary Care will be displayed on the search results page(s). You will see these individual PCP specialties listed directly under the "catch all" PCP heading. You can select any one of these PCP specialties individually as well. So if you are only looking for an Ambassador Care PCP in the Family Practice specialty, you can specifically select Family Practice. Personalized Printed Directory (when printing directories be aware that the process will take a few seconds so please be patient): You have the option to print your own personalized Sagamore Provider Directory. If you wish to have a printed directory you can print one yourself and personalize it to fit your specific criteria. After choosing a product enter your selection criteria on the Search page and when the Results are displayed you will notice a yellow button at the top of the Results list. Clicking on this button will allow you to print your own personal provider directory. Just follow the instructions. Printing a Complete Product Directory: If you make no entries on the Search page and simply click the Search button, the search Results will consist of ALL network physicians within the product line that you chose. Clicking on the "Print Directory..." (yellow) button will provide you with a complete directory of ALL physicians within the chosen product. Be aware that if you choose to print a complete Sagamore Plus or Select directory it will consist of over 1000 pages. A complete Ambassador Care directory will consist of over 180 pages. The Search Results page is now presented with up to 100 results per page until all results have been presented. Clicking on Next or Previous allows you to move through the list. The Provider Detail page now shows you the Ambassador Care PCP's network ID number if the physician is an Ambassador Care (Point Of Service) provider. This network ID number is necessary for you to know when signing up for the Ambassador Care product only. Sagamore has developed its web applications with the knowledge that most of our visitors will be using Microsoft Internet Explorer. While we try to maintain compatibility with all web browsers, we recommend using newer versions of Microsoft Internet Explorer to ensure full functionality, a more secure connection, and in many cases better performance. Please read about our suggested browser and settings.